Celeb Gossip News – What ref Mike Dean did during Man City vs Chelsea is HILARIOUS… did you spot it? 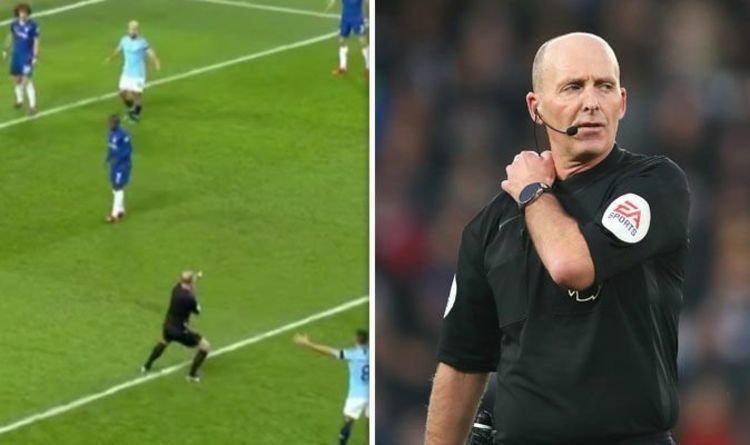 What ref Mike Dean did during Man City vs Chelsea is HILARIOUS… did you spot it? Dean once was seen wandering off the Stamford Bridge pitch practicing his golf swing and grinning at the TV gantry. On another occasion, the Premier League ref appeared to celebrate a Tottenham goal when he dramatically pointed back to the centre circle. And on Sunday eagle-eyed fans were able to add another classic to the Dean files with the bizarre way he awarded Manchester City a penalty against Chelsea. Cesar Azpilicueta brought Raheem Sterling down in the box with 55 minutes on the clock and Dean had no option but to point to the spot. In true Mike Dean style, he did it with a touch of swagger. Dean jumped into the air before dramatically squatting as he gave his decision. With the match live on Sky Sports, there were no shortage of viewers tuning in to witness the act and hundreds rushed to Twitter to discuss it. “looooool mike dean is so funny,” wrote one while another said “Anyone else notice Mike Dean go into a squat position when awarding that penalty”. “Mike Dean has definitely attended a power pose TED talk,” joked one while another included five crying emojis and said “the way Mike dean gave that penalty tho”. “Mike Dean pointing to the penalty spot looked like a dancing move,” laughed another. “Why can’t Mike Dean just point to spot normally?” pondered another. Dean was taking charge of his 473rd Premier League match at the Etihad as Manchester City hosted Chelsea. The 50-year-old, who first officiated a top flight match in 2000, has issued a record 99 Premier League red cards during his career – but No.100 didn’t come on Sunday.